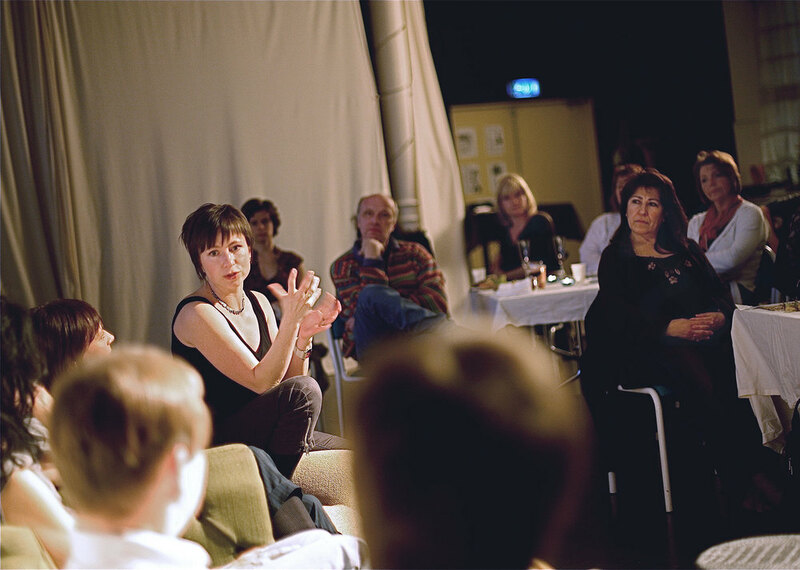 Dansbaren (The Dance Bar) is a series of public talks, seminars, lectures and discussions. Initiated and developed since 2003 by the Gothenburg artist-run platform Dansbyrån, it began as a wish to create a large critical mass among dance practitioners and audiences. Dansbaren’s focus is to fold and unfold theories, practices, and perspectives about dance and choreography. Dansbaren has the ambience and energy of a café and carries on an oral tradition of the circulation of knowledge. Held at Dansbyrån Studio and other places, a café situation is created (cafésittning in Swedish) by the setup of the room and by providing food and drinks. The event starts with one or more guests who are invited to share their practices and discourses by giving a talk or participating in a panel. Following that, the event then proceeds as open discussions throughout the entire room. It always ends in informal small talks which linger on the topic of that evening. Over the years, Dansbaren appeared with regularity —from every month to twice per term, and invited more than 120 guests. In 2015–2016 authors/editors Marika Hedemyr and Ingrid Cogne worked on the format of a publication to further Dansbaren’s future. From today’s perspective, Hedemyr and Cogne re-activate and develop a number of themes from Dansbaren in order to initiate a dialogue between past, present and future. The publication Dansbaren—The Mob without Flash aims to spur on a critical approach to knowledge, both in and through artistic practice and theory. From 2016 Dansbaren has moved into a touring format that departs from the publication Dansbaren - The Mob Without Flash (2016). Funmi Adewole (NGA/UK), Phax Ahamada (SE), Lene Bang (DK/UK), Harmony Bench (USA), Catharina Bergil (SE), Anna Bergström (SE), My Bergström (SE), Ulrika Jonasson Borggren (SE), Paul Bothén (SE), Kerste Broberg (SE), Paula Caspao (PT/FR), Alejandro Chavéz (MEX), Ingrid Cogne (FR/AT/SE), Lisen Dellenborg (SE), Devdatt Dubhashi (SE), Palle Dyrvall (SE/BE), Anne Ekenes (NO), Claes Ekenstam (SE), Kate Elswit (US/GB), Johan Engström (SE), Vahid Evazzadeh (DK), João Fiadeiro (PT), Floke (SE/USA), Anna Forsell (SE), Claes Forssell Andersson (SE), Eleftheria Gerefokas (SE), Lena Gunnarsson (SE), Johanna Gustavsson (SE), Caroline Hainaut (BE), Sara Hallström (SE), Marika Hedemyr (SE), Karin Hedin (SE), Ismo-Pekka Heikinheimo (FI), Gunilla Heilborn (SE), Nina de Heney (SE), Mateusz Herczka (SE), Nadja Hjorton (SE), Malin Holgersson (SE), Paula de Hollanda (SE), Åsa Holtz Svensson (SE), Tommy Håkansson (SE), Patrick Idström (SE), Eva Ingemarsson (SE), Anders Johansson (SE), Aleka Karageorgopoulos (SE), Ali King (UK), Susan Klein (USA), Sonny Koroschetz(SE), Riku Kotiranta (SE), Petra Kuppers (DE/US), Mireille Leblanc (SE/CAN), Efva Lilja (SE), Lisa Lindén (SE), Victoria Lugo (MEX), Gun Lund (SE), Frauke/Caroline Lundblad (SE), Marie Lundqvist (SE), Lasse Långström (SE), Svante Aulis Löwenborg (SE), Iki Gonzalez Magnusson (SE), Maria Malmström (SE), Erin Manning (CAN), The MAP Consortium (UK), Aloun Marchal (FR), Myriam Mazzoni (SE), Anna Mesquita (SE/BR), Eva Milich (SE), Sigge Modigh (SE), James Mweu (KE), Yukimi Nagano (SE), Rani Nair (SE), Magnus Nordberg (SE), Johan Nordqvist (SE), Carmen Olsson (SE), Cecilia Malmström Olsson (SE), Juan Olvera (MEX), Manuel Pelmus (RO), Alexandra Pirici (RO), Alain Platel (BE), Christer Reveny (SE), Jannine Rivel (SE), Moa Matilda Sahlin (SE), Barbara Simonsen (DK), Anton Sjöstrand (SE), Sanne Skjervik (SE), Ami Skånberg Dahlstedt (SE), Rolf Sossna (SE), Mårten Spångberg (SE), Marcus Steinweg (DE), Karin Stenmar (SE), Sahar Taklimi (SE), Emma Tolander (SE), Paula Touvinen (FI), Hanna Uddenberg (SE), Anette Utterbäck (SE), Mariana Vázquez Omaña (MEX), Martina von Schwerin (SE), Anna Wemmert (SE), Minna Elif Wendin (SE), Anna Westberg (SE), Leandro Zappala (SE/BR), Älvsborgsensembeln/RTV (SE), Johannes Öhman (SE), and more.